I will talk about weapon (archtype) design later. First, there a bunch of inevitable extras I need to do. My weapon visual properties are getting out of hand. There is one big problem with projectiles and effects in that they don’t match their “elevation”. That is, all sprites are on the ground and when I spawn things in relation to other things, they will either be on the ground, or I need to “cheat” and manually move their world coordinate up/down. But I am changing their coordinate, not their elevation, which makes all sorts of weird misalignments happen. This is what happens with weapons firing — since the weapon barrel is not the same level as the player is, the projectile needs to be offset vertically. And changing such one specified value just breaks all the others. I don’t like this, so I am just going to add an elevation value to all my entities. 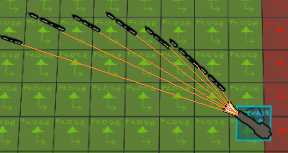 This way I can spawn a projectile that is on the same “ground” as the player, but elevated, similar to effects. This works both for projectile and muzzle flash and I don’t need another offset for muzzle flash. This makes my iteration and adjustments super-fast, especially when I change the sprite. And finally this works. This example is a very extreme one with values set stupid-high just so I can test how it handles. And, if it handles this even remotely well, then it will do for normal weapons just fine. The last problem is that the bullet spread is a bit too random — the “recoil” is completely random within its acceptable arc. It looks dumb. And speaking of recoil, it’s just a little bit too finicky adjusting so many variables. And since I don’t really have any good visual debug to see how my smaller numbers affect things, I don’t want too many of them. So may be I can change how it works and solve both these issues. This makes the code slightly more complex as I need to track time across different firing states instead of just multiplying a couple values. But it’s worth it in order to express the options much clearer. Anyway, my “add another weapon” task extended into “fix 20 other issues” again. I’m getting anxious spending so much time on these, but oh well.